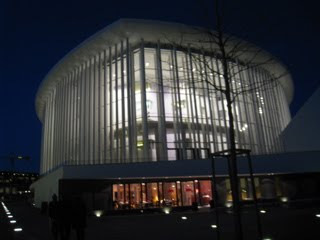 The Philharmonie in Luxembourg is a beautiful new hall. We were performing, for the second time, in the Salle de Musique de Chambre. (As at the Concertgebouw last night, there was Mahler 5 in the big hall next to us.) The Salle de Musique de Chambre is a fascinating room; the audience descends into it as if into a wooden cave.